Following a lengthy apprenticeship with a local Haarlem painter, Pieter Saenredam made a career specializing in what might be termed architectural portraiture. The clarity and harmony of his powerfully descriptive views of churches, stripped of earlier Catholic furnishings by the Calvinists, is underscored by his subtle manipulation of line and color. In the Kimbell painting, a crisp, cool light floods the interior, enlivening it with blue and pink tones as it strikes the varied surfaces of the vaults and floor tiles, the thinly painted figures providing a sense of scale. On the niche of the pillar at the left, the artist neatly inscribed his name and the date that he painted this view of the Buurkerk. Saenredam’s known oeuvre—fewer than sixty paintings—is small, owing to his meticulous working methods. 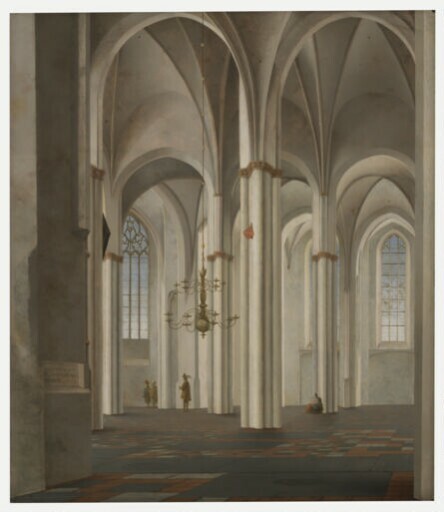 His paintings of churches throughout the northern Netherlands are based on meticulous perspectival drawings, or cartoons, derived from sketches and measurements taken in situ. The paintings themselves were executed in the studio, sometimes years later, as in the case of the Kimbell painting and the companion view of the same church interior, painted in 1644, that is preserved in the National Gallery, London. The pen-and-chalk drawing that Saenredam made as the basis for the two compositions, now in the Municipal Archives of Utrecht, bears the date August 16, 1636. He made subtle adjustments to his initial site drawing, heightening the elevation and maximizing the vertical thrust of the architecture to convey the church’s lofty interior. When Interior of the Buurkerk, Utrecht was examined with infrared light, a careful linear underdrawing, characteristic of Saenredam’s church interiors, was revealed. Saenredam achieved perspectival accuracy in this underdrawing with use of a vanishing point. Evidence of the pinhole he used for this purpose appears on the surface of the painting in the column at the right. The Kimbell panel and the related National Gallery painting appear to have been traced from opposite halves of the same chalk construction drawing, which is preserved in the Municipal Archives of Utrecht. It seems that the panels, which were painted a year apart, were never intended to be joined, since they have a very different tonality. The Kimbell’s painting is cool and light, while the National Gallery’s is warm.The painting’s wooden support has been preserved unaltered. An unusual feature is that it is pieced together from three planks of different widths, with their wood grains running in a horizontal direction. A more typical support for this size and shape would have been a single vertically grained panel. The edges of each piece of the Kimbell panel appear to have been roughly beveled before assembly and then slightly refined thereafter. The marks of the carpenter’s tools can still be clearly seen on the reverse. (sale, Christie’s, London, 16 June 1900, no. 63). by inheritance in 1951 to Alexander James Trousdell, Meopham, Kent.